Slot machines are among the most misunderstood of all casino games. This is important to understand because slot machines are also some of the most popular games and are beloved by the majority of online casino players. Unlike the early slot machines, modern slot machines, whether they be spinning reels or video slots, operate using a Random Number Generator. 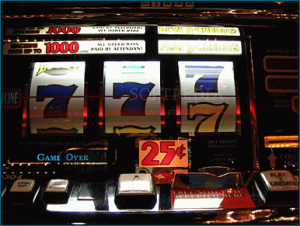 Commonly referred to as RNG, this is what determines the payouts and combinations for slot machines. It cannot be manipulated or altered in any way; online slot machines are purely games of chance. Slot machine winning and losing combinations are all pre-programmed. There are many more losing and small winning combinations than big wins and large jackpot combinations. Here’s a simple example of how slots work. Assume that the optimum combination starts at number one and the combinations will get worse as the bigger the number gets. The following combinations will be available when you place your bet by spinning the reels: 1,2,2,3,3,3,4,4,4,4,5,5,5,5,5,6,6,6,6,6,6,6,6,7,7,7,7,7 etc. As you can see, the top jackpot appears just once and as jackpots get smaller, they appear more frequently. The more the online slot machines are played, the more losing combinations or “near misses” will appear. Anyone who plays online slot machines regularly can tell you that after playing for some time you’re likely to hit several combinations that are very close to a big payout. This is not unintentional. These “near misses” are meant to make you feel that a big win is extremely close at hand. It’s hard to walk away when you can feel that a huge jackpot could be just a click away. The hard truth is that these near misses are just misses. There is no reason to think that you’re any closer to a big win because the RNG controls every combination and these aren’t based on any previous combinations. This is just a ploy by the slot machine manufacturers to keep you playing. Because the outcome of every spin is unrelated to any other, just because a jackpot has been one it doesn’t mean that the slot machines have “gone cold.” There is just as much of a chance of a machine paying out a jackpot twice in a row as there is if there were multiple spins between wins. Sometimes people will try to steer players away from the slot machines because they tend to have lower payout percentages than other casino games. This is not entirely true. For example, craps tables offer bets that have worse odds than the majority of slot machines. Sure, there are other casino games that offer much more competitive payout percentages. However, these games generally require a certain level of skill in order to capitalize on the higher payouts. Without the necessary skills, players can easily end up being worse off than they would have been had they opted for games of chance like slot machines.